Last week, the members of the Motorola Feedback Network based in Germany and the UK were invited to take part in the Moto G 2014 soak tests for Android 5.0.2. 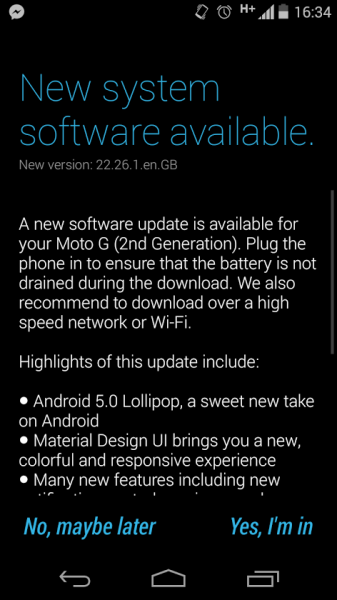 Now we hear that the official Android 5.0.2 Lollipop OTA update for Moto G 2014 is now rolling out in the two aforementioned countries. Of course, the Moto G Android 5.0.2 Lollipop update is being rolled out in phases, meaning that not all owners will get it at the same time. You know the drill: when the system update notification hits your device tap on it choose 'Yes, I'm in', wait until the download is completed, then press 'Install now'. Your smartphone should reboot and flash the new firmware. You can also perform a manual check under Settings > About phone > Software update > Check for software updates. Because we are dealing with a major software update, expect the update file to weigh in at over 600 MB. We are recommending you to download it using a stable WiFi network in order to avoid unwanted data charges. I remind you that Lollipop is the biggest update Android has received to date. Android 5.0 arrives with multi-user support for phones, Material Design UI, Smart Lock, Screen Pinning, security improvements, performance boosts, ART, support for 64-bit processors, revamped notifications bar and Quick Settings, heads-up notifications, lock screen notifications, dynamic status bar, better battery stats, battery saver mode, Priority Mode, and more. Are there any Moto G 2014 owners based in the UK or Germany reading this? Have you guys received the new software update. Please let us know in comments. In the UK we should now be getting Lollipop 5.0.2 versions for Motorola 2nd versions of; Moto E 2015, Moto G, 2014 (XT1068), and Moto G 4G 2015 (XT1072). Version one of each of the models should come later, but Motorola UK doesn't know when. We have the update available in Australia. But does it actually work, or will it kill my phone like it did my wife's Nexus 7? That's the question. Motorola couldn't answer this, but stressed that I update at my own risk. I won't be updating my Moto G until I see lots of positive feedback from users who've actually done it. Until then, KitKat works just fine.